I took the metro to the INA station, which is closest to Dilli Haat, without any issue whatsoever…and once there, I made what turned out to the best mistake I could have made. Most metro stations in Delhi have multiple gates, and INA is no exception. Instead of exiting at the one closest to Dilli Haat, I hung a left and ended up across the street. 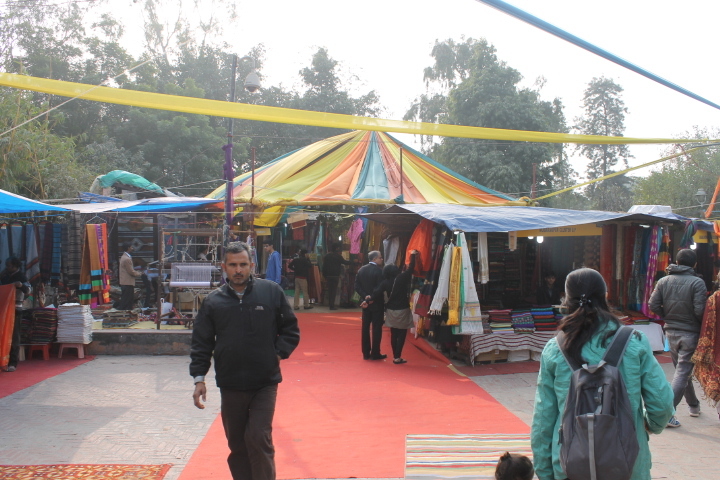 I emerged at the entrance of a market that I just assumed to be Dilli Haat, so I plunged in headlong. 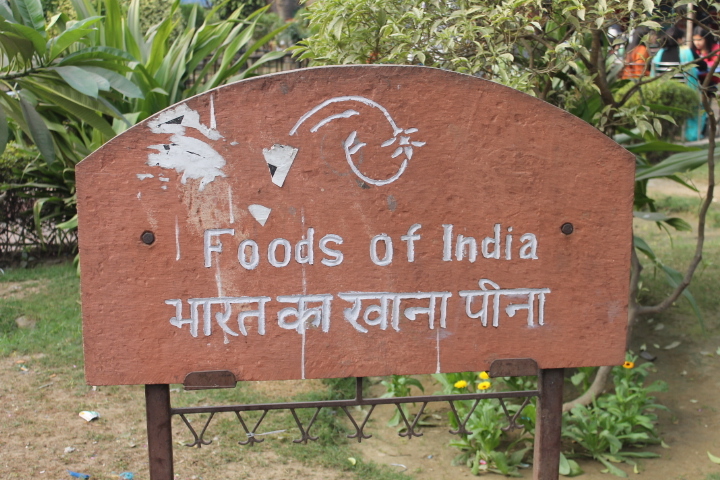 It took about two minutes before I started wondering why (what I assumed to be) Dilli Haat was such a tourist attraction. I didn’t encounter any other foreigners and this hallowed expanse of food stalls were nowhere to be seen. 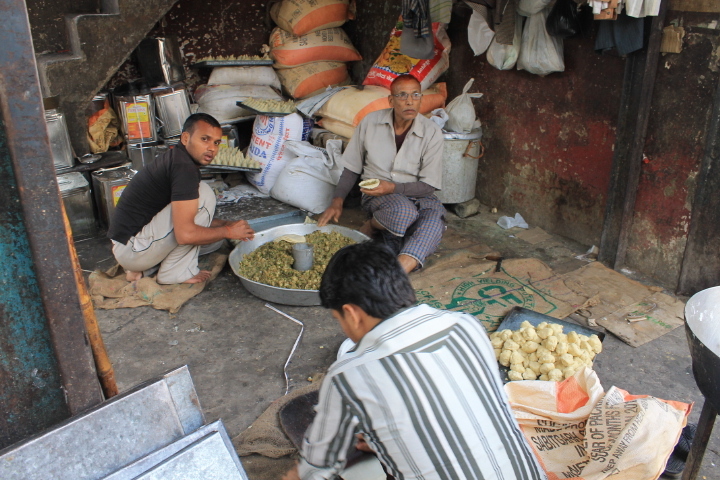 Making fresh samosas to be sold as a stall next door. Eventually, I chalked it up to reading some misinformation and plunked myself down at a dingy, hole-in-the-wall restaurant called A-One in one of the back corners of the markets. 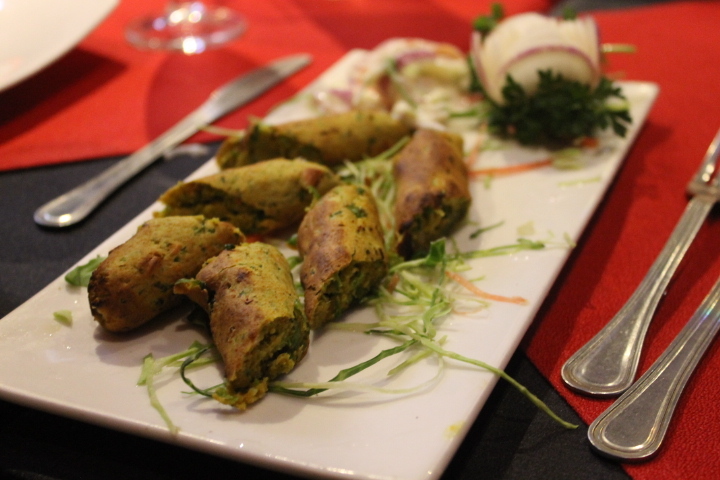 Appearances can be deceiving when traveling, especially when it comes to restaurants. The most expensive Michelin star-touting eatery can still give you food poisoning; the street food prepared by a guy with dirt under his fingernails and eaten at a folding card table might be some of the best you eat. Thankfully, my mutton masala, jeera rice, and stuffed naan turned out to fall firmly in that second category. 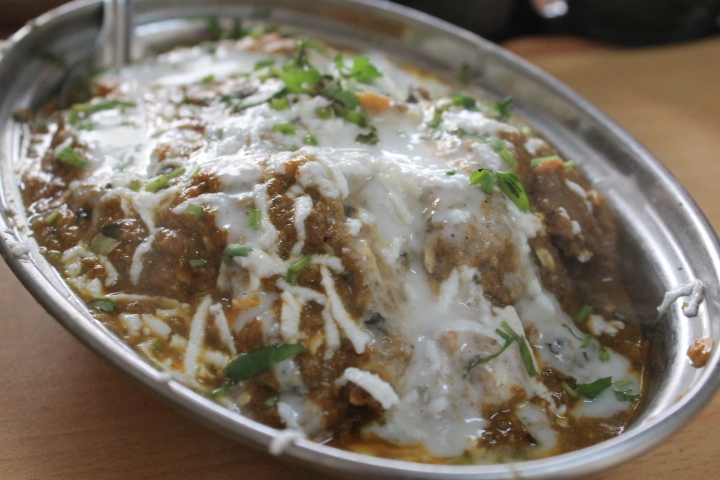 Mutton masala, topped with shredded paneer (curd cheese). 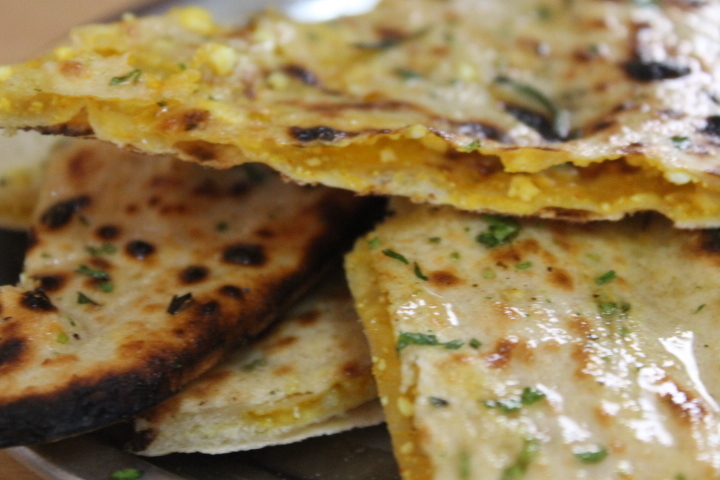 Stuffed naan, the perfect base for my masala curry. And as luck would have it, I ended up sharing my table with four Japanese women; one of them had been living in Delhi for several years and her friends were visiting for winter vacation. If people in Japan are surprised when I stumble my way through speaking Japanese, that doesn’t compare to the shock I encounter when I speak it in foreign countries. After I asked if it’d be all right to share a table with them, cries of “えええええ？” and “びっくりした!” (“Bikkurishita!” or “Surprised!”) filled the following few minutes. Between my elementary school Japanese and their English, we got through the usual battery of “Why/where do you live in Japan?”, “Why are you in India?”, and so on. And then the woman who lived in Delhi offered up a question that’s a jackpot for any traveler: “How did you find this restaurant? It’s really local…no tourists ever come here.” Success! They also informed me that I’d passed up Dilli Haat and had ended up in the INA Market…which explained my earlier confusion. Once we finished up lunch (which cost all of about four USD) and exchanged contact info, I headed across the street and ended up in Dilli Haat within about ninety seconds. 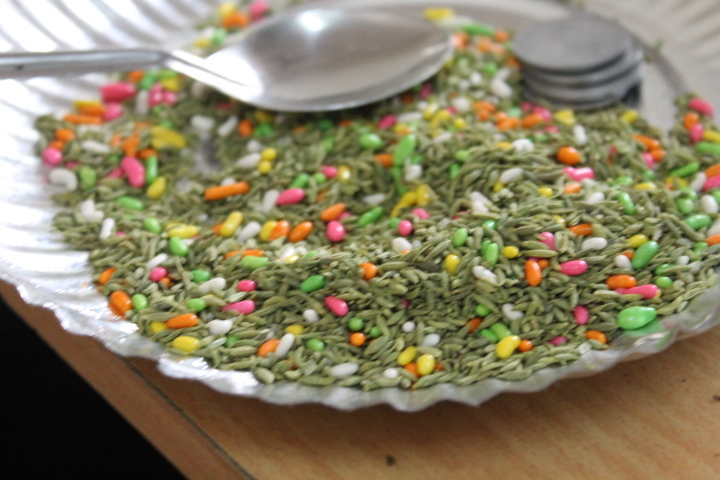 I also got my first taste of anise seed and sugar, which is commonly offered after a meal as a breath freshener. I also made the rookie mistake of taking a hefty scoop…which my new friends hastily corrected by telling me that I only needed a pinch. Dilli Haat may be famous for its food stalls, but the dizzying array of handicrafts that you first encounter are just as a formidable assault on the senses. Rosewood and sandlewood carvings, jewelry and beads, and shoes are just a few of the wares being plied there. Most beautiful and overwhelming are the vast expanse of any kind of textile you could wish for. 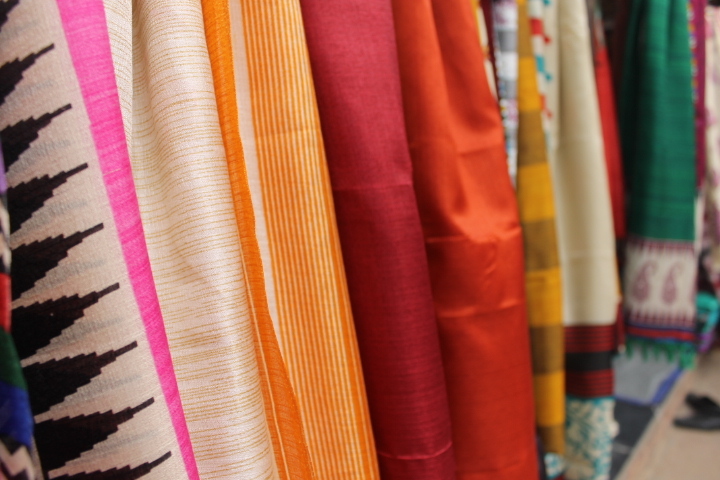 Dozens of stalls offer up an endless choice of patterns, colors, and materials. Unlike other stalls you might encounter on the street, the vendors at Dilli Haat must apply and pay a fee to sell their wares; after a maximum period of fifteen days, they’re rotated out to make room for different vendors. 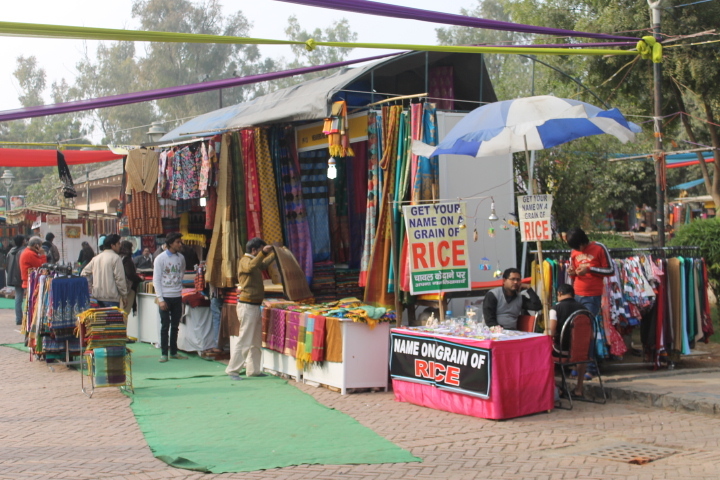 The open-air market at Dilli Haat. 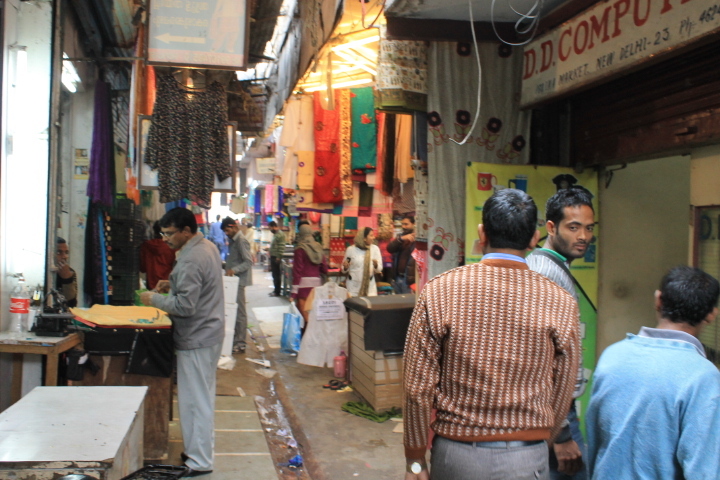 As with most any open-air market in India, bartering is the name of the game. It’s silly to pay the first price a vendor quotes you, especially as a foreigner, because it’s often inflated to two or three times what you can actually pay. And if all else fails, just walk away. That’s the quickest way to pay a rock-bottom price. 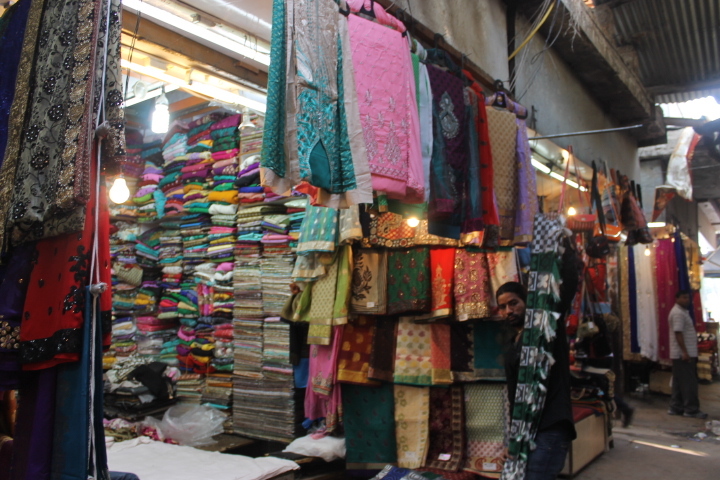 Since I knew I’d be faced with innumerable shopping opportunities over the next two weeks, I resisted buying any of the gorgeous scarves, shawls, and other handicrafts that caught my eye…but it was definitely a struggle. A tiny portion of the selection that Dilli Haat offers. As for the promised food stalls, I was too full from my lunch to force anything substantial into my stomach…except for one samosa, which I couldn’t resist. And when I saw a stall selling stick kulfi, my tastebuds demanded I indulge in one of those, too. Unlike the one I’d had on my food walk the previous day, this one was straight cardamom-flavored. I could’ve spent the whole day here and still not eaten everything. Finally, it was time to head back to my hotel in Karol Bagh and meet up with my fellow travelers for the first time. Two South Africans, three Australians, two Brits, one Irishman, two Russians, one Canadian, and two Americans (including myself) made up our group. It was a crazy mix of accents, cultures, and backgrounds, and breaking bread – or rather, naan – at a local restaurant proved to be the perfect introduction before we headed out the next morning, bright and early, to Jaipur. I have no idea what was in this Golden Crown Seekh, but the menu proclaimed it was the “All Time Favourite.” It took exactly one bit for me to agree. 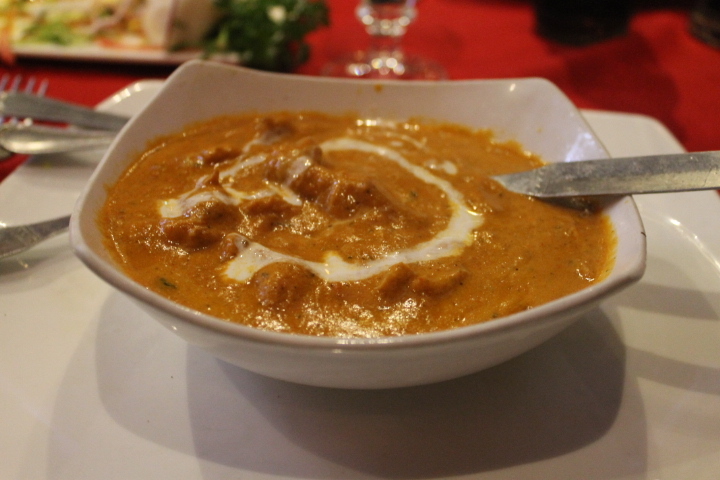 I also got my first taste of authentic butter chicken curry, and it made the butter chicken I’d eaten in Japan pale in comparison.